Merle Grubbs, age 91, died Monday, Dec. 3, 2018 at Methodist Hospital in Mansfield, in the company of her cherished daughters. Service: 2 p.m. Thursday, December 6, 2018 at Bethesda Community Church. Committal: 10:15 a.m. Thursday at Dallas-Fort Worth National Cemetery. She fiercely loved her husband, children, grandchildren and great-grandchildren. 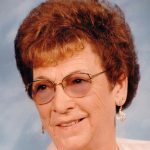 Throughout her life she served the LORD diligently, honored her parents, loved her family and many people that claimed her as part of their family. She was a servant of God first and foremost, a church musician, Sunday school teacher and church secretary and treasurer. She worked as a bookkeeper for the Las Cruces, N.M. public school system for 25 years in which she was never off one cent. She would search and study her calculations until she found any discrepancy. She was diligent in everything she put her hands to do. She was disciplined in every area of her life and loved people around her enough to encourage them to do the same. Her love for her husband of 70 years was complete and un-ending and out of that blossomed a love for her children that can be compared to none. Merle was born in Frost, TX on Nov. 1, 1927 and is preceded in death by her parents, Willliam Edward Searcy and Ida Hambrick, her brothers; Carl Hambrick, Whit Hambrick and Louis Hambrick. Her sisters; Mary Williams, Winnie Testerman and Faye Fuller. Survivors: She is survived by her husband, Leo Grubbs of Mansfield; daughters, Janelda Hodo of Mansfield, and Janice Splawn of Decatur; and son, Don Grubbs of Las Cruces, N.M.; one sister, Mildred Fuller of Amarillo; 13 grandchildren; 19 great-grandchildren, and many nieces and nephews.